San Diego Unified leaders pledged that incentives to coax expensive teachers into retirement wouldn't cost the district any extra money. Nine months later, the district still can't show its math. “We are not asking for an additional expenditure,” Marten told the board before they voted to approve the last round of deals. “We have identified the solutions to make sure that each one of these are cost neutral as we bring them forward for approval tonight. You are not approving a $25 million expenditure. You are approving the cost neutral (retirement incentives) as applied, as written in our” labor agreements. Trustee John Lee Evans, and others on the school board, also assured the public at the time. Now, nine months later, school district officials can’t show they’ve made good on that promise, which was written into the district’s retirement pacts with labor unions. The deal gave all eligible retirees a year’s salary, paid out over five years. The incentive, also known as a golden handshake or Supplemental Early Retirement Program, aimed to get costlier employees off the payroll to replace them with cheaper, less experienced employees who were scheduled to be laid off during last year’s $124 million budget cut frenzy. For the math to work, however, and not exacerbate the district’s budget woes, officials needed to keep some retiree jobs vacant. In the months that followed, the district called back to work hundreds of teachers and other employees who were scheduled to be laid off. After issuing 1,576 layoff notices to full- and part-time employees last Spring, only 137 non-teaching employees and 167 teachers were laid off, though some teachers returned to work this year on temporary contracts, a district spokeswoman said in December. That would mean 1,272 employees were ultimately spared from layoffs, more than the number of people who retired. On Jan. 17, Voice of San Diego asked the district for the final numbers showing the retirement deals achieved savings in its first year — the current 2017-18 school year — and over five years, as required by nearly all the district’s agreements with labor unions. District officials say those numbers still don’t exist. “The district will have that information with the next analysis prior to the June budget adoption,” district spokeswoman Maureen Magee wrote in an email. The district gave just one group, the district’s blue collar workers like bus drivers and custodians, a pass the first year, but still required savings over five years, records show. “All of this was transparent at the board meetings when the final approval was made with charts showing costs at some points that were later canceled out,” wrote Evans, the school board member, in an email this month. But that’s not what the charts showed. Instead, the charts showed replacing all 528 retiring teachers would cost the district nearly $636,000 over five years, while replacing all 600 non-teaching retirees would cost more than $24.4 million. But replacing every retiree was never the district’s plan, district officials said at the time. The board gave final approval before the final numbers had been worked out. The void of information about last year’s retirement deal is not the norm for San Diego Unified. District records show in years past, the school board received final numbers shortly after the retirement deals were finalized in May, and sometimes received multiple revised sets of numbers in the summer or early fall. In May 2009, more than 1,000 employees accepted an early retirement incentive, according to the Union-Tribune. By keeping 123 positions vacant, the district saved $11 million in 2010, and $31 million over five years, assuming those positions stayed vacant all five years, the school board was told May 26, 2009. The savings were also reported in the district’s audited financial statements that fiscal year. 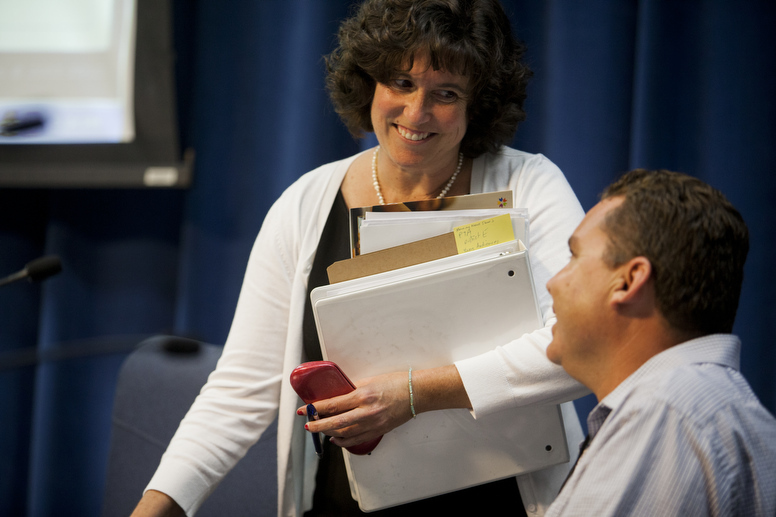 In May 2014, 477 San Diego Unified teachers took an early retirement incentive and final savings were revised at least three times publicly. The district finally reported to the school board in September 2014 the deal would save $8 million in 2015 and more than $30 million over five years, district records show. Excluding non-teaching employees from the 2014 offer was unfair but necessary, former trustee Scott Barnett said at a May 27, 2014 board meeting. That’s because the district could not achieve savings when crunching the numbers for other labor groups. The district is still paying out that five-year deal, the first approved on Marten’s watch as superintendent. Though whether those savings were actually realized is unclear, since district data shows certificated staff, a group that includes teachers, increased by 526 people between June 30, 2015, and June 30, 2017. 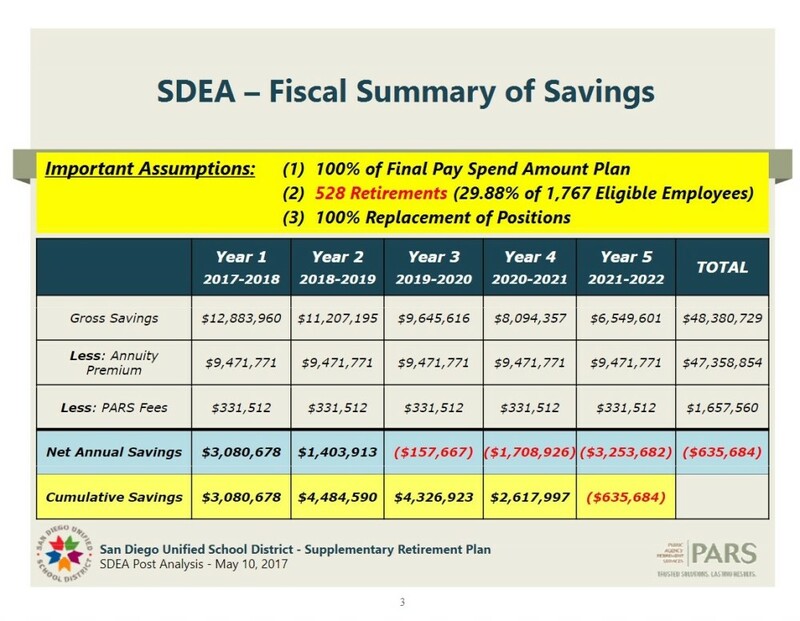 San Diego Unified’s audited financial statements for 2016-17 show the 2017 retirement payouts alone will cost the district $79.4 million over five years, or $15.9 million annually. No savings were reported.